Kleefeld on Comics: Wait... Why Am I Tearing Up? Yesterday and the day before, I had really good workouts at the gym. Today? Not so much. Nothing really hurt; I barely got myself out of breath; I just couldn't get motivated to really push myself. Even to my usual tolerances. 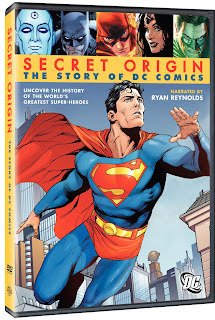 I finally made it home, nearly twelve hours after I had left this morning and found a copy of Secret Origin: The Story of DC Comics in my mailbox. You know what? I decided I was going to plop myself on the couch, eat my dinner and watch the documentary. Sorry, dog, you're not getting a walk tonight. I figured that since it's a 90 minute film covering 75 years of DC's history, it's probably not going to be that earth-shattering for me. 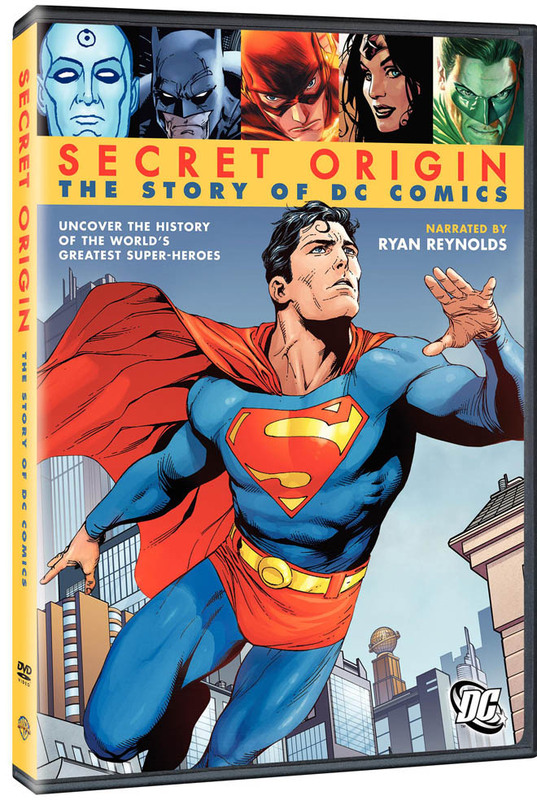 I've been reading and absorbing this stuff -- the history of comics, specifically -- for decades already, and this is a mass-market DVD. I fired it up and was in the next room sorting the rest of the mail when I heard Paul Levitz's voice at the start of the movie. (I was pleasantly surprised with myself for being able to recognize it.) I sit down a couple minutes into and start watching. There was the occasional photo or piece of footage I hadn't seen before, but the story was nothing new, as I suspected. I was largely interested in seeing their specific presentment of the material here. So, the movie's rolling along. I've finished my dinner by now, and they're about up to the 1970s. The powerful Green Lantern/Green Arrow comics. And Geoff Johns comes on and says something about how Green Arrow didn't have much of a personality before, so it was fairly easy to give him this angry hippie persona and it just sort of fit. And I notice there's a tear rolling down my cheek. Denny O'Neil comes on and talks about how he royally screwed up Wonder Woman, and how sorry he was about that. Another single tear. Len Wein comes on and relays how Alan Moore hung up on him when he tried to get him to write Swamp Thing. Another single tear. Batman with his Kryptonite-gloved liberalism beating down Superman's staid Reaganist conservatism. Another single tear. This went on for the rest of the documentary. 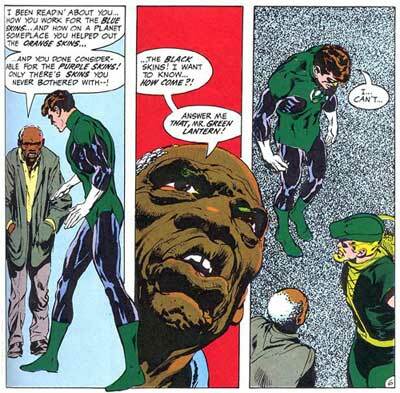 Not quite crying, really, but a slow trickle of single tears as significant moments in DC's history came up. I can understand the first one. Those Green Lantern/Green Arrow stories were some of the first comics I ever read. That classic blue skins/orange skins/purple skins/black skins speech left a HUGE impact on me. So that first tear was almost certainly nostalgia-induced. But to this day, I've never read those Wonder Woman issues. Or Moore's Swamp Thing. Or "The Death of Superman." Or half of the other moments they singled out in the documentary that caused me to tear up. I could see why Louise Simonson got emotional over the death of Superman; she helped work on the darn thing! But my attachment to much of what they were discussing diminished rapidly after the 1970s. I watched Super Friends up through 1983 or '84. I read The Dark Knight Returns and Watchmen as they came out. But my comic interests at that time were largely centered on the Fantastic Four and, by extension, the Marvel Universe. Even then, in another year or two, and I was reading as much about comics history and the mechanics of the medium on the whole as I was new comic book stories. So why would I continue tearing up as they were talking about Milestone? Or Kingdom Come? Or Batman Begins? Pieces I'm familiar with, but only because I returned to them long after the fact, specifically because of the cultural importance that I was able to retrospectively see they had. Is it that the nostalgic state I entered into earlier continued? Just misappropriating feelings from my earliest comic experiences onto more contemporary counterparts? Was it that the initial wave of nostalgia was being countered by some sense of machismo that prevented me from letting it all out at once? (Despite the fact that I've been at home by myself all evening.) Was it more of a nostalgia cycle that took a decided change of subject (the insanely long, every-language-on-the-planet series of copyright warnings after the movie) to snap me out of it? I don't really have an answer offhand. Just kind of wondering out loud. Any psychologists out there have some thoughts? If he's referring to that late 60's Sekowsky-era run, I don't think O'Neil "ruined" Wonder Woman at all. So I'd be more irked than tearful, at least at that particular juncture. Yeah, he was referring to de-powering Wonder Woman and giving her a martial arts mentor. O'Neil was apologizing not for the quality of storytelling or writing or whatever, but just the concept in general. He seems to think they were good stories, but not appropriate to place Wonder Woman in. But like I said, I've never read those issues myself, so I can't speak to their quality at all. Making my tearing up then all the stranger.